Heading down to the Crimple Beck from Brackenthwaite Lane. 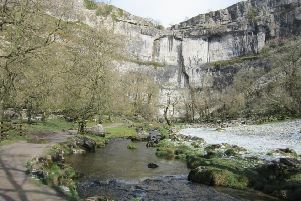 Here’s a little cracker of a walk – the perfect Sunday-afternoon delight. The landscape around Harrogate is rich green, vibrant and scenic and this short circuit makes the most of it. To top it all off, there is the chance of a pub-lunch stop at the half-way mark. Pannal formed part of the ancient manor of Rossett, now a suburb of Harrogate, in the Domesday Book of 1086. William of Normandy, after his triumph at Hastings in 1066, displaced the joint Saxon owners, Gamelbar and Ulf, and gave half of the manor to his Standard Bearer, Gilbert Tyson, and kept the other half for the Crown. At this time, Pannal was no more than a farmstead or two; it was certainly not known by its present-day name. The new Norman overlords brought early prosperity, building two corn mills by the Crimple Beck at the communities we now know as Pannal and Burn Bridge. It is probable the corn mills were operating before the estate was gifted by Henry III to the warrior Hugh Pagnell in the mid-13th century in recognition of his services against the Scots. This is the period when Pannal acquired its name, derived from the surname of its new lord. The Pagnells were influential Normans who had been rewarded soon after the Conquest with numerous estates in Yorkshire. They were generous benefactors of the great religious houses and, as Lords of the Manor of Leeds, helped to found Kirkstall Abbey in the mid-12th century. The Pagnells’ link with Pannal spanned only one generation - after Hugh’s early death, Henry III gave the manor to his brother, Richard, Earl of Cornwall, who was Lord of the Honour of Knaresborough, based at Knaresborough Castle. Richard turned Pannal into the most important village in the area by granting it a market and fair. In 1287, he gave the avowdson of Pannal church - the right to appoint the rectors - to the tiny Trinitarian friary of St Robert’s at Knaresborough. The friars named Pannal church after St Robert, the only Anglican establishment in England to be dedicated to the Knaresborough hermit-saint. Park in Crimple Meadows which is just off Main Street in the centre of Pannal opposite the church. Walk back to Main Street, cross it and turn right along pavement, soon crossing the Crimple Beck when Main Street becomes Station Road. Cross to right side of road and turn 1st right along Mill Lane. At end of Mill Lane – a branch sweeps right into properties at Mill Cottage – go straight ahead to a new fingerpost for the Ringway (a long-distance path round Harrogate) and bear right (pond on your left). Continue to arrive at more properties and a fork where a branch turns right – go straight ahead past a row of four garages and then ignore a fingerpost on your left at cricket nets. Follow the track out to road on edge of Burn Bridge and take path opposite to emerge in Brackenthwaite Lane and turn right. Walk single file, facing the traffic for about 600 yards, passing Woodside Farm on your left, to arrive at a 2-sided fingerpost on your right for the Ringway at Maw Hill Farm. Turn right and go down left edge of field to enter trees, cross footbridge over the Crimple Beck and climb the other side, through a walkers’ gate, towards houses. On emerging in road (Hillfoot Lane), turn left, soon passing Hillfoot Manor and a plaque on wall marking the site of the first Wesleyan Chapel in Pannal built in 1788 and where John Wesley preached. Soon, ignore a bridleway fingerpost on your left for Fall Lane – sweep right up Hill Top Lane to a fingerpost and steps on your left at a house drive. Take this path, soon climbing more steps, and go along an enclosed path, through a gate into field and turn right (arrow). 1: Go past a semi-circular wall on your right and straight across the field with a wall a few yards to your right to an obvious gateway. Go through gateway – gate open, on our visit – and straight ahead to next gate, pass through and go diagonally left down the field, as arrow, and pass the right end of a row of trees in mid field. There is an arrow sending you between the two righthand-most trees. Go straight ahead to a prominent stile in hedge, cross it and go slightly left over next field to root out a stile and four-sided fingerpost to right of a large tree. Cross stile and turn right for Lund House Green. Go through a gate and up right edge of field, through next gate (stile) and onward by hedge to emerge in Hill Top Lane at Lund House Green. Turn left along grass verge for about 100 yards and then turn 1st right along Whinney Lane, using the footway, and passing the Squinting Cat (lunch anyone?). On passing pub, cross to righthand side of road and continue for a few yards to an old box-top footpath sign at the 30 mph signs. Turn right along a narrow, enclosed path which leads into a field and cross the field half left (as arrow). Go through a gate with Ashville College sign and go almost straight ahead across the field (arrow) walking below a grass banking and with the former police college to your right. Go past rugby posts and straight ahead, past a large black box, to exit playing fields to emerge in road (Yew Tree Lane). Cross the road and turn right along pavement with Ashville College on your left to gain a fingerpost at end of a basketball court and turn left. This enclosed path leads over more college playing fields to emerge in a road (Green Lane), cross it and turn right along pavement. 2: At T-junction with Leadhall Lane, turn left down pavement into the dip to spot a half-hidden fingerpost on righthand side of road next to a telegraph pole and just before a street called The By-Ways. Turn right at fingerpost and follow the enclosed path along the backs of houses and then over a field with a row of detached houses across to your left. At end of this enclosed path, cross a stone stile and turn right (fingerpost: Ringway). Cross the Stone Rings Beck and go up the slope for a few yards to a fingerpost at a fork and take the left branch for the Ringway. Descend the enclosed path with Stone Rings Beck and houses to your left. At bottom of slope, turn RIGHT through kissing gate (fingerpost) and take the strong path over the fields towards Pannal with no diversions whatsoever and with the houses and church at Pannal growing ever closer. Enter the graveyard via a stile and go past right side of church and onwards into Main Street with Crimple Meadows and the finish opposite.